The monument erected over the grave of Michael Dwyer, one of the survivors of the Fenian Rising, commemorates the Irish Dead of the 1798 revolution in Ireland. Michael Dwyer, born in Wicklow, Ireland, in 1772, was 26 when the 1798 Rising against English rule began. He received his first independent command as a captain at the Battle of Hacketstown. The English subdued the Rising but, although other units surrendered, Michael Dwyer continued with a highly successful guerilla resistance which caught the imagination of the Irish people looking for rays of hope after the defeats of 1798. He led the English on a merry dance until December, 1803, when he and some of his lieutenants surrendered voluntarily on condition they be sent to America. However, the English reneged and, without a trial, sent them to the penal colony of Botany Bay for life. They were classified as state prisoners, not convicts, so they were treated as free settlers when they arrived in Sydney on February 15, 1806; each received a land grant of 100 acres (40ha) along the Cabramatta Creek. Dwyer spent a brief time on Norfolk Island (he was accused of organising a rising in Sydney). Then he was named as one of three new constables to serve the Georges River area. Governor Lachlan Macquarie gave him a full pardon in 1814. In 1885 a group of working class Irishmen in Sydney formed a social group, the Shamrock Club. From 1886 they organised an annual pilgrimage to Dwyer’s grave in the Devonshire St cemetery.They would have erected a monument there, but the state government chose the cemetery as the site for Central Railway Station and to move the graves elsewhere. With the centenary of the Rising approaching, the Irish community sought a conspicuous resting place for the ‘Wicklow Chief’ and his colleagues. The Irish community was prevented from moving the remains of other 1798 veterans. Only Michael and Mary Dwyer were to be buried at Waverley – on Sunday, May 22 1898. It was the largest funeral Sydney had seen with 400 horse-drawn carriages following the hearse in a procession of 10,000 people watched by 100,000 others. A committee led by Dr Charles William MacCarthy paid £50 for a plot in the centre of Waverley Cemetery, overlooking the ocean. 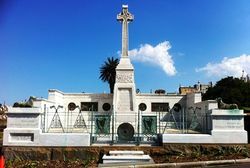 The £2000 needed for the memorial – with its Carrara marble, bronze plaques and wolfhounds and mosaic floor – was raised by the Irish in Sydney, country towns in NSW and in Queensland, Victoria and New Zealand. 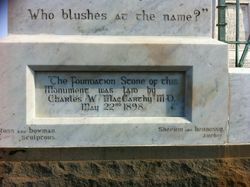 Hence the inscription: “Erected by the Irish People and Sympathisers in Australasia." Easter Sunday, 1900, was chosen as the day for the opening of the completed monument. 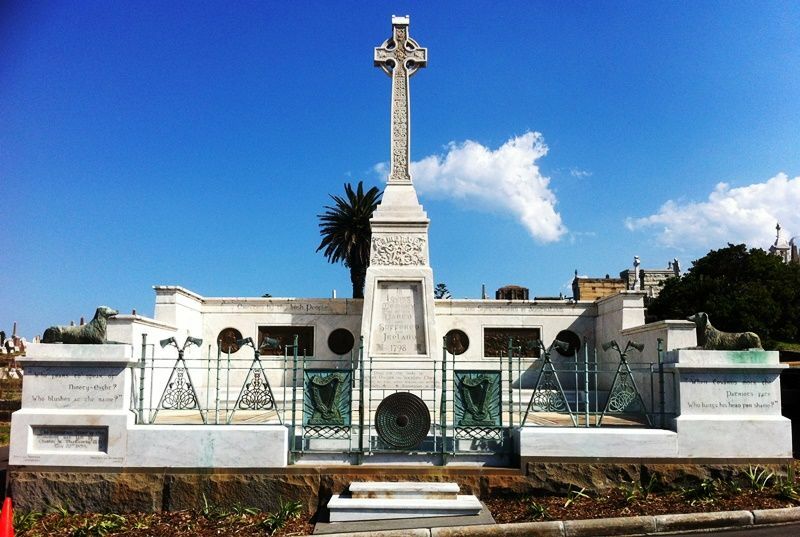 The ceremony of unveiling the monument erected in the Waverley Cemetery as a memorial to those Irish patriots who suffered for the parts they took in the memorable insurrection in 1794 was performed yesterday afternoon by Dr. C. W. MacCarthy, chairman of the committee. The function was witnessed by many hundreds of ladies and gentlemen. The monument, which is erected over the graves of Michael Dwyer and his wife in the Roman Catholic portion of the cemetery, cost about £2200. 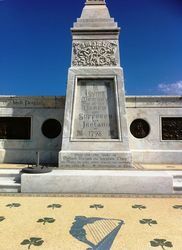 It is constructed of Carrara marble. The bronze medallions and panels were designed and modelled by Dr. C. W. MacCarthy, and the castings were made by Messrs. Castle and Co, of King Street, Newtown. The designs of the monument and full-size details were prepared by Messrs Sheerin and Hennessy, of Pitt-street, Sydney, and Messrs. Ross and Bowman, of Waverley, were the contractors. Pray for the souls of Michael Dwyer the ‘Wicklow Chief’ and Mary his wife whose remains are interred in this vault. "Who fears to speak of Ninety - Eight ? Who blushes at the name ? " "When cowards mock the patriots face who hangs his head for shame ? "